Sterling Silver Kiddush cup decorated with cold enamel. 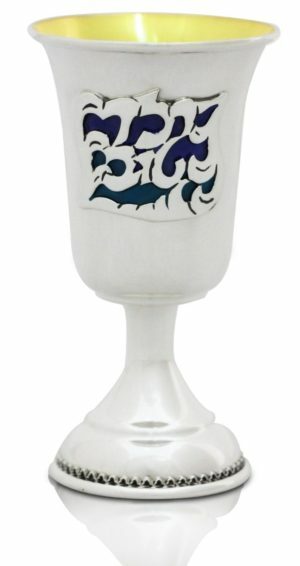 The Kiddush cup design is kept simple to truly highlight the magnificence of the decorative enamel. 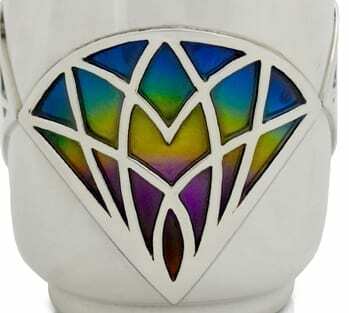 Curved silver diamonds with silver petal designs are filled with enamel, in a choice of a rich blend of blues or in a multicolored kaleidoscope, to create a rich and unique border around the body of the cup. The decorations dance in the reflection of the curve silver edges at the top of the cup, harmoniously glittering with the golden light of the Shabbat candles which reflect off the smooth silver. The Kiddush cup is coated in gold to retain the taste and quality of the wine, and the gold enhances the melody of colors in the cup. The cup sits gracefully on a flower shapes silver base, with silver and enamel petals around the rim, creating the look of a flower in bloom.